In some cases, you might want to test if the streaming coming from your camera is working correctly while using the same connection method as Angelcam. You can use this method if you are getting a choppy stream, if it you're getting an error instead of a video, if the resolution doesn't seem to be correct and so on. 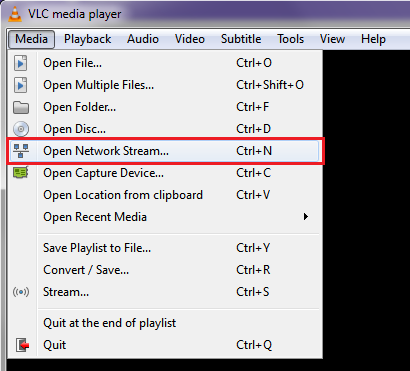 Open the VLC player, select "open network stream" and click "play"
Paste the address into your browser (Firefox recommended in this case). Internet Explorer and Microsoft EDGE won't work at all. There shouldn't be a significant difference between the quality from an Angelcam website and the quality when viewing the stream directly in 95% of cases. If there is a difference, feel free to contact us and we will check it for you, the issue might be with something else.